The trilogy that started it all … now bundled for 33% off! Every book in Aubrey Parker's lineup takes place in the same “world,” sharing characters and weaving a slow narrative behind each book's specific story. 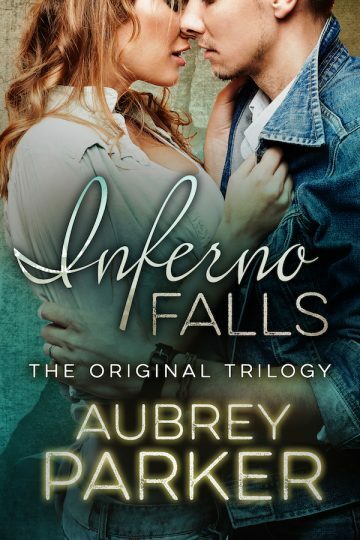 That world centers on the small town of Inferno Falls … and this 3-book collection is where it all began. Coming home from college, Riley James is presented with a golden opportunity: learn the ropes of her father's real estate company so she can help run it … and one day take it over as her own. But she hadn't planned to face her father's protegee, who hopes to steer the company's ship in the meantime: Brandon Grant, who finds himself tempted into an illicit affair with the boss's daughter. Loner guitarist Brandon Grant is a broken man — struggling to recover from the loss of a bandmate and a woman he loved. He used to write beautiful music but now finds himself too tortured to go on … until he finds his muse in Abagail, who threatens to destroy the walls he's so carefully built around himself. Maya found herself pregnant when her high school boyfriend split town in search of bigger and better things, leaving her to raise her daughter alone. But now, years later, Grady is back … and with him, Maya's delicately-held world threatens to come crumbling down. Aubrey Parker the author of the Trillionaire Boys' Club series, Trevor's Harem, Gagged, and many more. Save big with the Inferno Falls collection, and see where all those later stories began!